A long ride in a tuk-tuk from the city centre of Phnom Penh, alongside other tuk-tuks and motorbikes laden with goods for market, brings us to a somewhat forlorn suburb with various sized houses, some unfinished. Cambodia has not got round to many things we take for granted in our societies. One of them is a tax system and another is rubbish processing. A lot of it lines the roadsides. 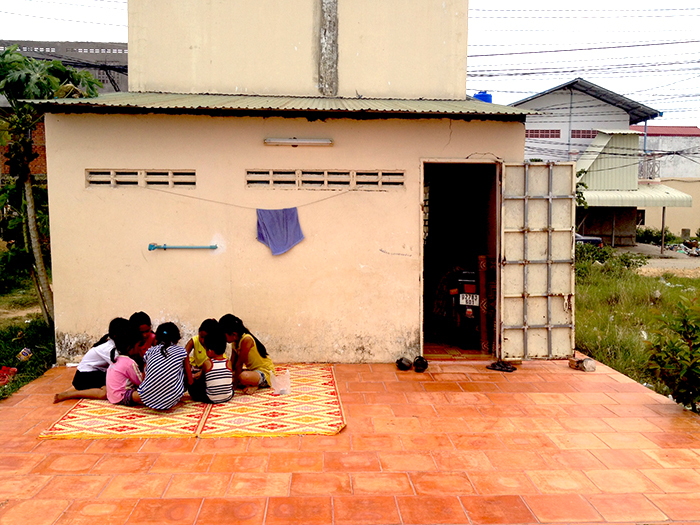 As we approach Chenla’s family home, we see that many children have come together to play in the backyard. We enter the house through the back door after handing out stickers to the kids. 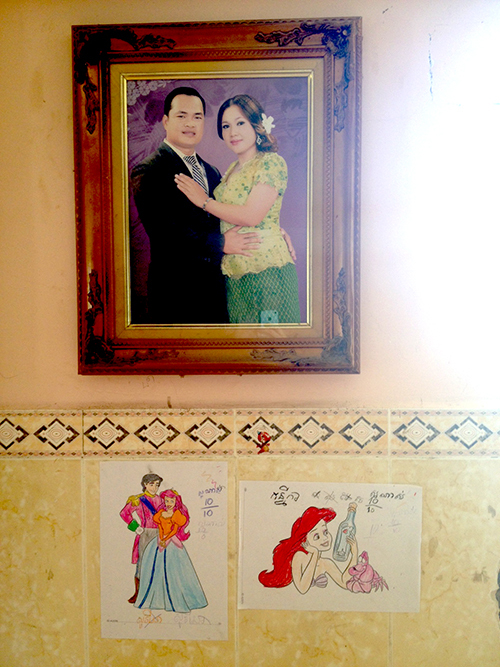 As in every Cambodian household, a large wedding portrait of Chenla and his wife Raksmey takes pride of place on one wall, with drawings by his young daughters Soriya and Kaknika taped below. Chenla met Keang, the founder of Craftworks Cambodia, in Phanat Nikhom refugee camps in his twenties. I can sense a strong bond between them. Listening to them talk about their life in the camp brought tears to my eyes, being a witness to the selfless life and work they have both chosen. Chenla was born in 1980 in a refugee camp, the eldest son of a family with 6 brothers and sisters. His parents escaped to the refugee camps in Thailand in early 1980 just after the notorious Khmer Rouge era / Pol Pot regime. He and his family lived in the refugee camp for 14 years. His life then was very difficult, he did not have enough income for food and the only way he could earn any money was by waking up before dawn to pick up leftover rice, bottles, cans and other rubbish in the dust bins to sell to a Thai businessman. The family returned to Cambodia in 1994. They were homeless, landless. and facing severe difficulties. 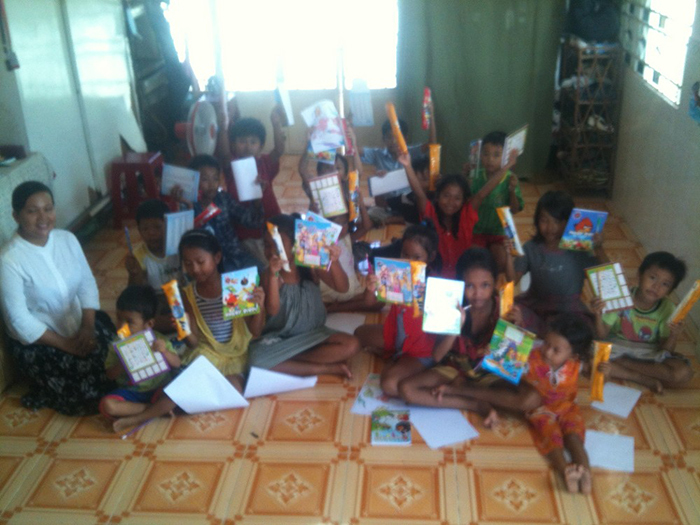 There was not enough food, no income, no employment, and no shelter to stay in when they arrived in Cambodia. A relative gave them some land and they built a temporary tent to live in. Chenla was now old enough to be a motor taxi driver in the village and he helped support his family. He ended up leaving school after grade 7. 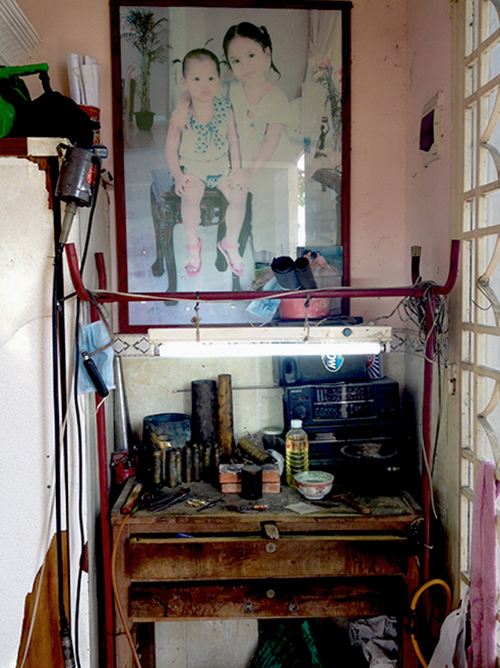 He decided to go to Phnom Penh city to find a job there and he was introduced to a man who taught him to make jewellery. Using the jewellery making skills he learned he now makes jewellery from recycled brass bombshells for Craftworks Cambodia. He is now a very skilled jeweller with ten years of experience. In 2001 he married Kuoch Reaksmey Wong, at the River of Life church. His wife was born in a different refugee camp near the Cambodian Thai border. Chenla worked for River of Life church from 1997 till 2013 in many different roles including worship leader, musician and helping to teach orphans. 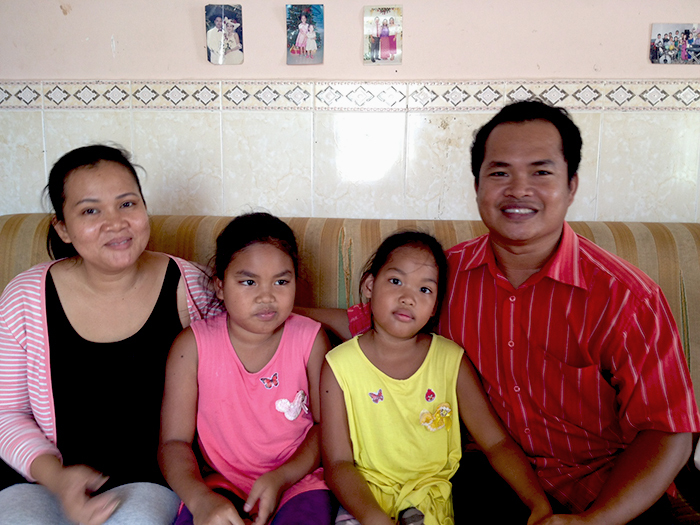 He decided to resign from his position at church because he wanted to spend more time with his family and work full time making jewellery as the orders from Craftworks Cambodia were increasing. The extra income helped his family; it helped his daughters to go to school and even helped the kids in need in rural communities. On 1 June 2014 Chenla founded a new church in his home. Without any funding from overseas or other churches, the family has been able to organize and manage the 35 children in the church by themselves. Most of the kids come from very poor communities, they are malnourished, and lack love and care in their own families. Most of the kids’ parents go to work in the garment factory down the road, and the children are left all day without care. He and his wife decided to buy them slippers, notebooks, pencils & pens, snacks, water, drinks, and sometimes meals for them on Sundays. 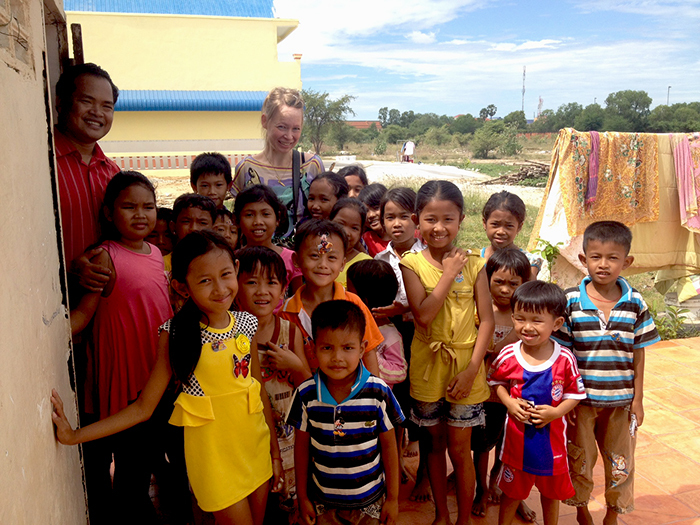 Chenla’s wife, Reaksmey, acts as a Sunday School teacher and gives some extra care to some of the children who need it by washing their hair and cooking food. “We have clearly heard the voice of God,” Chenla says. He plans to develop a workshop at the back of the house and eventually buy the plot of land next door to develop a three storey building with a workshop, a church, and a home for orphans on top.